Paul Walker puts in the winning flight in Expert Precision Aerobatics at the 2015 Jim Walker Memorial Spring Tune-Up in Portland, Ore. 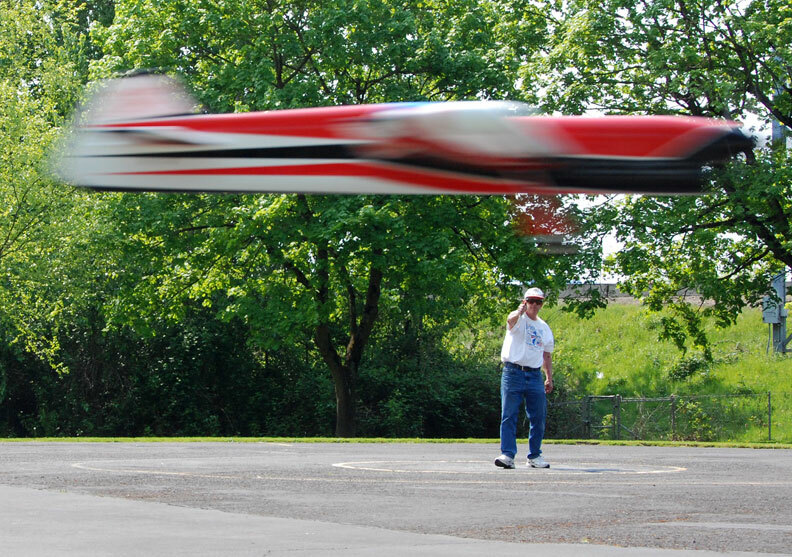 The Portland flying site, surrounded by trees, often presents wind-related challenges to precision aerobatics fliers. Flying Lines photo. One of the most common questions I get is how do I fly in the wind. What are the secrets? Well, before we go too far, let's define what wind is! What is the definition of wind? That question varies significantly based on who you ask. Some think that wind above 5 mph is wind, others think wind starts at about 10 mph, and others' threshold is at 15 mph. Along with the wind speed (yes, a scalar quantity lacking a constant direction) is the smoothness, or lack thereof. I've heard Randy call the bumps in the air biscuits. Big lumpy disturbances that physically move the plane without your inputs. We've all flown in those conditions, and it is no fun. I find that if the air is smooth, I can still put in a good scoring flight up to about 15 mph. If the wind increases above that point the probability of a real good score certainly goes down. However, if the plane's trim is off, the threshold of good scoring goes down. Remember the performance curves described in the past? The trim of your plane determines how fast your score will decay as the wind speed increases. For now, let's assume wind is the speed that causes you unease at the thought of flying. No matter how good the motor runs, and having a positive attitude, if your plane is out of trim you WILL have difficulty extracting good scores from the judges. Likewise, if the motor run is not what it should be, even with perfect trim and attitude, you will have difficulty. Finally, if your attitude is off, your perfect plane will not go where it needs to. Let's look into each of these in more detail. The previous discussions on trim should get you close to meeting the first requirement. What is good trim for flying in the wind? In my mind, there is no wind trim I put the plane in to fly in the wind. Part of my trimming process is to adjust to plane until it flies equally well in dead air, perfect air, and strong wind. There will be a trim that may work well in the wind, but it may not work well in dead air. For now, let's ignore this issue. There are many secrets for flying in the wind that I have heard. Some suggest extra tip weight. I find that to be counterproductive. Yes, it helps in some places; however it can lead to serious problems in corners. You can get a real nasty surprise in the last corner of the hourglass if you find the need to lean on it. It can also cause issues with the third corner of the hourglass distorting the shape, and forcing the issue on the last corner. That extra tip weight will cause the third corner to not turn clean, drop the outboard tip (roll away from you) and significantly increase the radius of the corner. It can easily feel like a stall with the plane not wanting to turn at all, and just skid through that section of the maneuver. At that point the geometry is compromised, and many times will lead to the panic fourth corner. This is not what you want! Some suggest that the CG move back some for the wind. Again, I don't find this helpful and it now will respond differently than what you practiced with. It can also reduce your overhead line tension and you certainly don't want that in the wind. So, as I stated earlier, adjust your trim so that it is the same for dead air, windy, weather, and perfect conditions. This takes some time to do, but you will end up with a plane that feels the same in all conditions. This gives you an advantage when the wind blows as you will not need to adjust yourself (or the plane) to the conditions. Saying all of that, I find that having the leadouts as far aft as possible will help with flying in the wind. This setting also needs to meet the criteria of flying in dead air and perfect conditions well also. In the process of trimming, there are a few points in the pattern to be aware of when evaluating the trim of your plane in the wind. I find the following three locations very telling of your trim. They are: 1) The start of the four leaf clover, 2) the overhead eights, and 3) wind-up that you may experience in round loops. Starting with the clover, when you start to enter the first loop at 42 degrees you will start in a place such that when 90 degrees of the first loop is completed you will be directly downwind. At the point of first applying up to start, you will still have a tailwind component that makes the entry soft. If you find that the plane just doesn't want to make that first loop, it goes loose and comes in at you, it is highly likely that your leadouts are too far aft. This is one critical point that just has to be right so that you can complete the pattern. If the leadouts are too far aft here, simply adding tip weight doesn't solve the problem . Because of this issue, many will try to bias the maneuver to the left so that the entry can be executed. However, this creates issues later on in the maneuver as it can easily distort the second and third loops. Be aware of this. Next, watch the overhead eights. If you find the plane gets soft halfway through each loop as it is now heading back into the wind, it is likely that your leadouts are too far forward! Move them aft and try again. Yes, you are running in direct opposition to the four leaf clover needs. This can easily become a balancing act that you will have to decide where to place the leadouts. However, there is one more place (thing) to check and that is the tendency for the plane to wind up in the strong wind in consecutive maneuvers, like the round loops. Since I started running electric power, I found that as the leadouts moved aft, the less the plane tended to wind-up in the strong wind. With electric power, the motor runs the same every time, and this effect was very clear to see. In the past with internal combustion engines, I noticed it but thought it was simply an engine/tank phenomenon and dismissed the observation. However, it is real, and noticeable. Don't get me wrong here, moving the leadouts aft will not eliminate wind-up, but it will minimize it enough to feel. And any advantage I can get I will take! The point here is to carefully test your plane in the wind, watching these three areas, and optimizing it to fly in the wind. In general, I have found that trimming the plane to fly well in the wind will generally make it fly well in the dead air. But don't take my word for it, test it yourself. Once you have decided on the right trim, you can consider flying a bit faster to get through the bad air better. The downside is that your timing will be disrupted a bit, but if the air gets real bad, this is an option. Watch out for the outside squares as that downturn to start can get to the bottom corner VERY fast. It will give you a bit better penetration in the overheads and vertical maneuvers. This is something you are going to have to decide on for yourself. Testing this prior to a competition flight is of course the preferred option. This section is for internal combustion engines. Electric motors either run at a constant speed or use the Igor Burger accelerometer-based controller. If using the Igor system, it is only a matter of setting the parameters that increase and decrease the motor speed. The internal combustion engine controls much of what can happen in the wind. Standard muffler systems have limited power up capability and braking but can still be made to work reasonably well. It becomes a combination of compression ratio, venturi size, and prop. I managed to win the 87 Nat's in the wind using a ST 60 with a tongue muffler. That was the state of the art for the time. I followed one of my hints mentioned earlier and flew faster. I ended up going 4.8 second laps on 70-foot lines to get through the overheads. Since then with the advent of the tuned pipe, things are different. With the tuned pipe, it can be adjusted to give more boost, or less, depending on the conditions. In general, I opted to keep it the same for all conditions to keep my timing the same. Regardless of the parts behind the exhaust, having the motor power up when needed and not contribute to wind-up is the key. Here the tuned pipe is superior, as it resists the wind-up better than a muffled system. With the resistance to wind-up, more boost can be dialed in to get through critical power maneuvers with minimal wind-up in the rounds. The key here is getting it adjusted correctly. Once again, you need to spend time on the practice field trying different pipe lengths, and pipe diameters to find the best combination for your needs. Back in 1998, at the Nats of course, my trusted OS 40 VF that I had used exclusively since 1990 felt weak in Friday evening practice. I quickly removed it and put a brand new one in. Several flights later I removed the 40 size pipe and replaced it with a 60 size pipe. That made a big difference to the power delivery. The finals on Saturday were in near dead air and that big pipe helped power that Impact through those conditions besting all the .60-powered planes on that day. The point here is that you need to try these different adjustments to find what works for you. I had tried that pipe at home, but created too much power for my style at cool sea level. But knowing that helped me in what to do with the hot humid conditions in Muncie that day. The bottom line to the power system is that it MUST supply adequate power when requested and MUST resist wind-up as well. This can be done with IC or electric, your choice. This category was generalized by the term "positive attitude." In reality, you need a positive attitude, the want to do well, and motivation to succeed. It does require all three pieces. OK, positive attitude to me is having the knowledge in your abilities to get the job done in the wind. The minute you have a second of doubt, you have lost. It really requires you to have practiced enough in the bad wind to know what has to be done to do well. Practice in 15+ mph winds whenever you get the chance. Keep doing it over and over to improve your skills, reflexes and plane trim. Do it until you are tired of it, and then do many more. It needs to be done enough so that you will know exactly the planes strengths and weaknesses, and this knowledge will be your strength in a competition wind flight. Now, you have a positive attitude, now what? You need the want to do well. Sure you want to score well, however you need the drive to do well. This is a huge factor in a good flight in the wind. You MUST want to attack the wind and take it hostage! Really, there can be no give on this point. You must want to do it, and you must know you can do it well. To cap this off, you need MOTIVATION. This puts a point on the positive attitude and the want to give you the best possible chance at a great score. Let me give you an example. It was the 1994 Nats in Texas, and two rounds of the finals had been completed. There was some wind, and one of the finalists had done well with a flight in relatively light air, and was leading. The wind then picked back up. As a result, I was pretty much deflated and had virtually given up on winning. I had the positive attitude as I knew I could do it, and it was the Nats so I wanted it, but something was missing. Then this person went around to the other finalists and shook their hands and described how much fun he was having. It wasn't his intention, but it struck me the wrong way. I felt he was congratulating himself at our expense prior to the final outcome. That was it! I was going to show him now! I now had the positive attitude, the want and now REAL motivation. I really focused on my last flight, in the wind, and smoked one in. In the end I had won by one half of a point. The motivation I was given was a huge factor in that score! Sounds great, but really, how do you get that attitude? That's a tough question. I believe it is important to stay properly hydrated when competing, and to be properly rested as well. Getting tired is a big deterrent to having a positive attitude. Once tired, it seems that one is always reacting to situations as opposed to being in control and ahead of issues. Prevent that by being rested, hydrated, and then you can KNOW that you are prepared and you will do well. I take it as a challenge to myself to control the conditions, not having the conditions control me. And find some motivation to get the results you want. Next time we'll discuss how to approach the pattern in these bad conditions.